The prevalence of incisional hernias (IHs) is still high after midline laparotomy (ML). There is an increasing body of evidence that prophylactic mesh placement (PMP) can be safe and efficient in the short-term outcomes, but there still are some concerns about the potential long-term complications of these meshes. This study describes our long-term PMP experience. Observational and prospective study including all patients undergoing the use of prophylactic onlay large-pore polypropylene meshes for the closure of ML since 2008 to 2014. Outcome measures included demographics, perioperative details, wound complications, recurrences, reoperations and chronic complications. A cohort of 172 patients was analysed: 75% elective surgery, 25% emergency cases. Mean age was 68 years with mean body mass index (BMI) of 28.6 kg/m2. Wound classification: 6.4% clean; 85% clean-contaminated; 1.2% contaminated and 8.1% dirty. Follow-up of patients was up to 8 years (mean: 5 ± 1.6). Two meshes were removed due to chronic infection in first six postoperative months. Of the 13 patients (9.02%) who developed IH, 5 of them have been reoperated for IH repair without any difficulty related to previous mesh. During follow-up, 8 patients have been reoperated for other reasons and the integrity of abdominal wall was also checked. After the comparative study, higher BMI and emergency surgery were still risk factors for IH despite PMP. In our setting, the use of polypropylene prophylactic meshes in MLs is safe, efficient and durable. 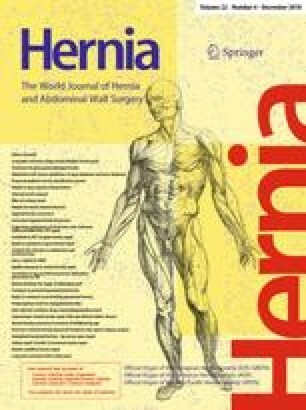 This study has not been previously published or submitted elsewhere for publication and it will not be sent to another journal until a decision will be made concerning publication by HERNIA. The online version of this article ( https://doi.org/10.1007/s10029-018-1833-x) contains supplementary material, which is available to authorized users. We would like to thank Dr. Tobby Hammond, from Broomfield Hospital, Mid Essex Hospital Trust, UK, for his careful and extensive revision of the English grammar and composition of this manuscript. MAGU, LAB and JLM conceived of the presented idea. MAGU, CS and DM designed the study. CS, EJ, CJ and PL collected data from the registry and AR verified the analytical methods. MAGU and EG encouraged CS, DM and EJ to investigate and supervised the findings of this work. All authors discussed the results and contributed to the final manuscript. Dr. San Miguel reports no biomedical financial interests or potential conflicts of interest. Dr. Melero reports no biomedical financial interests or potential conflicts of interest. Dra. Jiménez E reports no biomedical financial interests or potential conflicts of interest. Dra. López reports no biomedical financial interests or potential conflicts of interest. Dr. Robin reports no biomedical financial interests or potential conflicts of interest. Dr. Blázquez reports having received lecture fees from WL Gore & Associates. Dr. López-Monclús reports having received grants from Gore. Dr. González reports no biomedical financial interests or potential conflicts of interest. Dra. Jiménez C reports no biomedical financial interests or potential conflicts of interest. Dr. García-Ureña reports having received lecture fees from Covidien and B Braun, grants from Gore and fees for development of educational presentations from Gore and Medtronic. Approval from the institutional review board was not required for this study. The study including human participants has been performed in accordance with the ethical standards of the Declaration of Helsinki and its later amendments. Informed consent was obtained from all patients prior to all surgical procedures.